We all know my dislike for tempeh but this one I can actually do. I don't know if it was baking it in a marinade for an hour and a half or marinating it again in a rich Korean style barbecue sauce that did the trick. 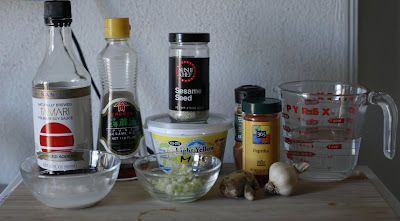 The result of doing this was that the usual taste of tempeh disappeared and was replaced with a sesame, slightly spicy flavor. I also loved the udon noodle salad. I could eat a whole bowl of this alone. But do make sure when purchasing the kimchee that it is vegan. I had to go to two different Asian markets to find a kimchee that did not contain fish. I really need to learn how to make my own though. Maybe that's something I can accomplish in 2011. This meal did take awhile to make, so my suggestion would be to make some of it ahead of time. I baked my tempeh the night before and that greatly did help to reduce the things I needed to do the day of. Anyone else a big fan of Korean food? 2. Heat the sesame oil and sesame seeds in a saucepan over medium heat. 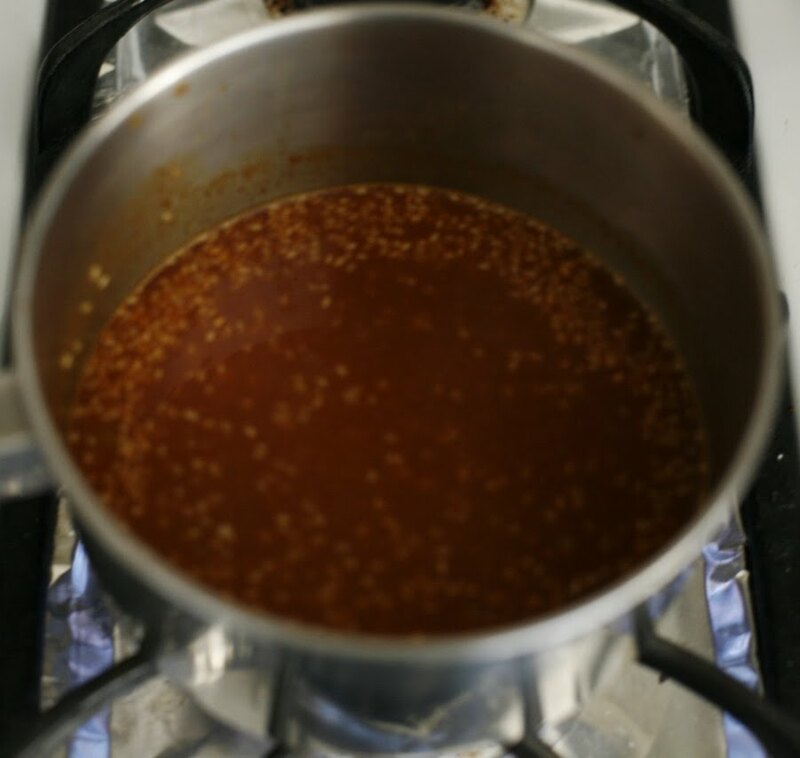 Toast the sesame seeds in the oil for 1 minute, stirring often. 3. 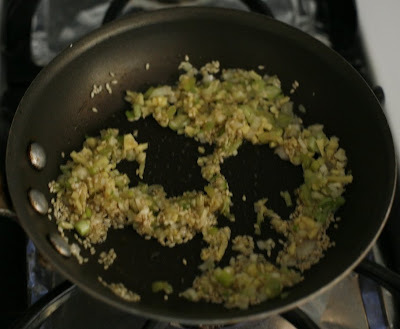 Add four-fifths of the minced garlic, and the ginger and scallions. Saute for 2 minutes, or until starting to brown. 4. 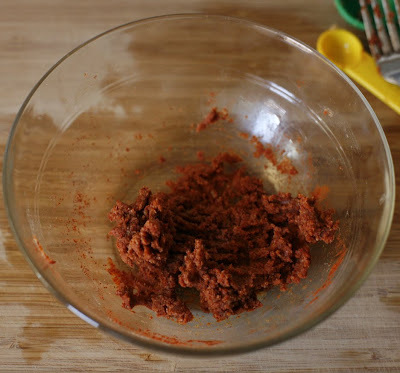 Add the Korean chile paste mixture, tamari, sugar, and stock. Simmer for 15 minutes. 1. Bring 2 quarts water to a boil in a saucepan. Place the noodles in a large bowl. Cover with the boiling water and let sit for 10 minutes, or until al dente. Drain and let cool under cool water. Drain well. 2. In a large mixing bowl, combine the citrus, kimchee, cucumber, bean sprouts, scallions, cilantro, lime juice, tamari, and sesame oil. 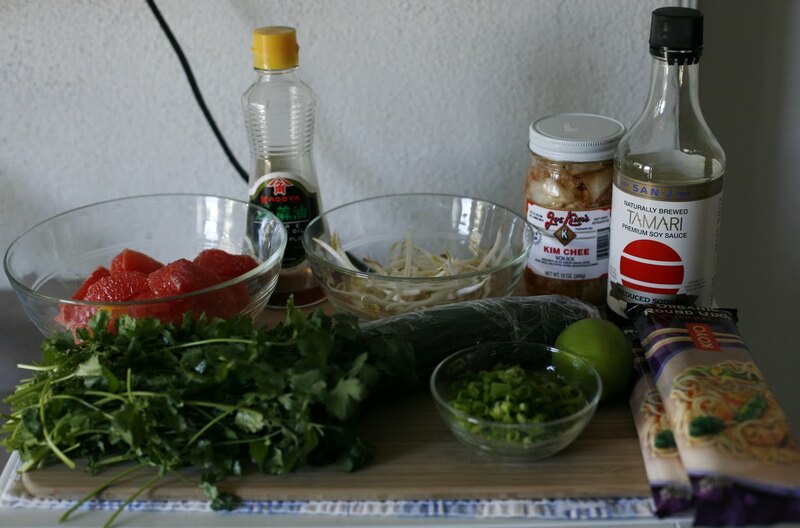 Add the rice noodles and toss well. Reserve until needed. 1. Place a skillet or wok over high heat. When very hot, add the oil, and then the onions, garlic, and ginger. Saute for 30 seconds, or until lightly browned. Add the bok choy and salt. 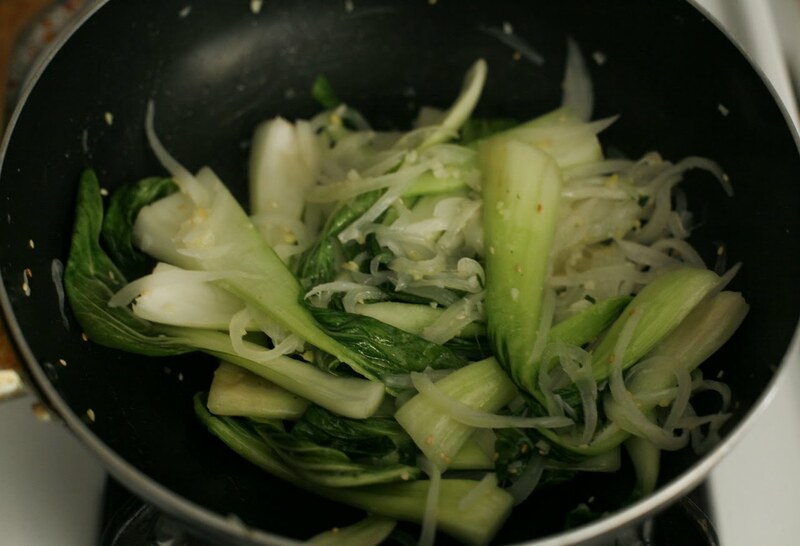 Saute, tossing the mixture often, for 2 minutes, or until the bok choy just begins to wilt. 2. Add the sesame oil and sesame seeds, and toss. Transfer the bok coy to a platter. Keep warm. 1. 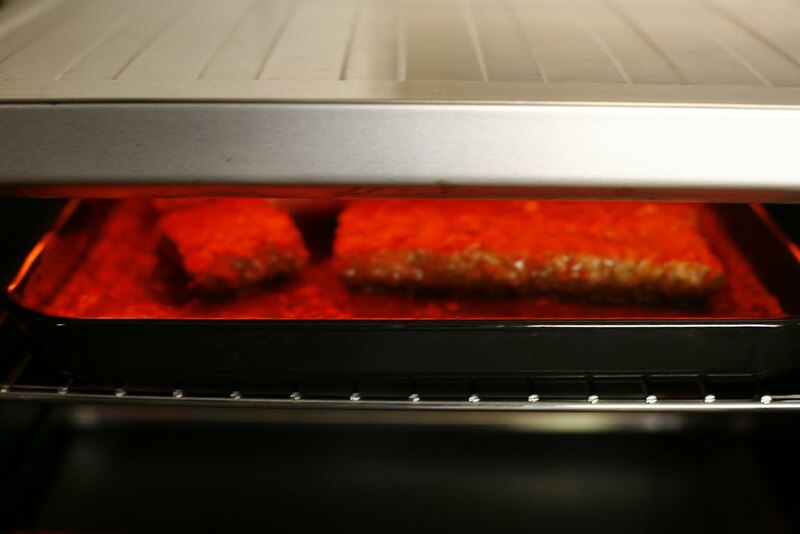 Preheat the grill or broiler. 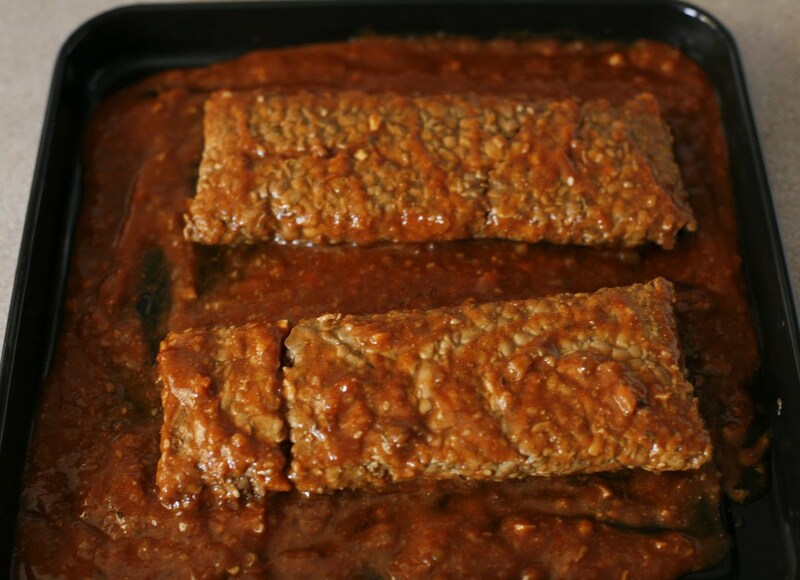 Place the barbecue sauce in a large baking dish. Add the tempeh and cover with barbecue sauce. Marinate for 20 minutes. Grill or broil the tempeh for 2 minutes per side, or until the sauce caramelizes on the tempeh. Remove from the heat. Slice the tempeh diagonally into 1/2 inch wide pieces. 1. Preheat the oven to 350 F. Combine the wine, stock, tamari, garlic, mustard, sage, thyme, nutmeg and pepper flakes together in a bowl. 2. Place the tempeh in a baking pan and pour the marinade over the top. 3. Bake for 1 1/2 hours, or until the tempeh absorbs the marinade. I haven't had a lot of Korean food, but what I have had, I liked. I would really like to learn more about cooking it. Like you, tempeh isn't my favorite, but it sure looks and sounds good in this case. 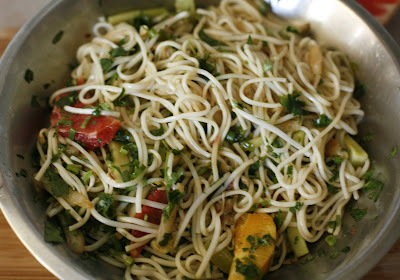 I could devour a whole bowl of that noodle salad too! you are a great cook and I love these great meals. Wow, what a meal, Jacklyn! It's funny with tempeh because I am just getting the hang of cooking it in a way that's appealing to me, too. It's so healthy, isn't it, that we need to keep on trying. Same thing with Korean food. I keep trying it, but it's not my favorite Asian type of food. Maybe I haven't found that one magical dish yet. Great job on another beautiful meal! I don't know who said that Kimchi is not vegan/vegetarian. Kimchi is usually vegetarian unless they add fish or other types of seafood like squid to give it more flavor. The normal ingredients are Korean cabbage, salt, chili peppers, garlic, onions, green onions, carrots... I am Korean and make them from time to time without any seafood! 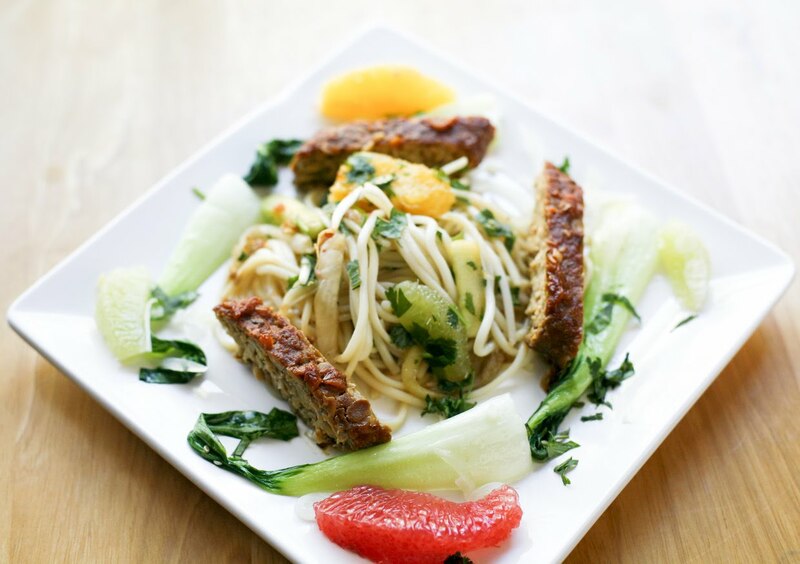 i love tempeh! i eat it like once a week. As usual your photos are beautiful and the food looks so tasty. I hope you have a beautiful Christmas! I haven't eaten very much Korean food, but this looks delicious! I have close to no experience with Korean food (cooking, eating, anything!) but this makes me want to learn more, asap. It sounds amazing, and your photo looks utterly delicious. This looks so delicious! And I love the presentation too.